Children of all age, during the CPI-Maoist regime in remote villages of Jharkhand lived under the fear of guns. The government school buildings were once indoctrination centre of Maoists and hardly teachers visited the area. 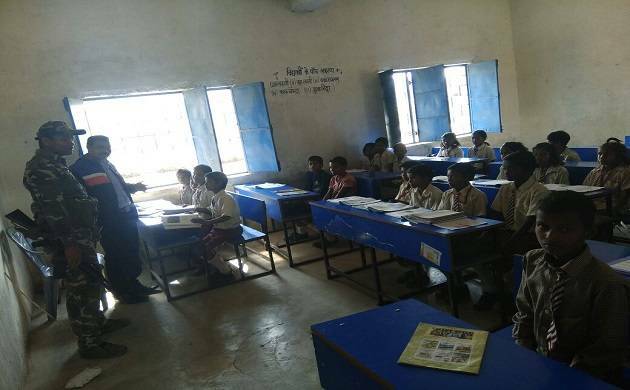 An inspector rank officer taking regular class of students in a remote village of Palamu. With the change in uniform from olive green to camouflage, students and villagers living in hinterlands of Jharkhand’s Palamu district see a ray of hope as schools are refunctioning. During the CPI-Maoist regime, children of all age in remote villages of Jharkhand lived under the fear of guns. The government school buildings were once indoctrination centre of Maoists and hardly teachers visited the area. But with time things have changed but guns are still present. “We wish we don’t have to see these guns again. We have suffered a lot, but we know these guns will not harm us,”said Shambhu Yadav, a villager of Patsara village. Jharkhand Police along with Central Reserve Police Force and CoBRA have managed to flush out Maoists from a major part of the district. After dominating the Maoist hit zones, Jharkhand Police officials reopened the schools. Wiped off all Maoist propaganda graffiti from school walls and distributed books and other stationery items. Palamu SP Indrajeet Mahata along with his officers have adopted villages. They regularly visit the hinterland and take classes. “We hope the children staying in these far off villages will not have to see our guns,” said Mahata talking to News Nation. He added, “It's a compulsion for our officers and personnel to be with their weapons during their visit to these villages as we don’t want to give any opportunity to the Maoist to ambush our forces." Palamau district of Jharkhand is one of the 195 most affected leftwing districts of the country. The district since the rise of Maoism in the state has witnessed deadly attacks on security forces and civilians. According to government figures more than 100 security personnel and more than 1000 people have lost their lives to Naxalism in the last three decades. The district has seen one of the most devilish face of CPI-Maoist. The Maoists after killing CRPF troopers had surgically implanted IEDs in their abdomen in 2013.